If you like math and you love jokes then you’ve come to the right place as we have the best funny math jokes! Most of the collected sayings and jokes are repeated in a number of webpages, which makes it difficult to credit a particular Internet source. Instead, we thank all Internet collectors of math jokes. So here’s our favorite funny math jokes for teachers. Student: You don't know my father ! Teacher: If I had five coconuts and I gave you three, how many would I have left ? Student: In our school we do all our arithmetic in apples and oranges. Student: No I got them all wrong by myself ! Student: No, Teacher, I'd have nine. I already have one rabbit at home! Student: My mother does it all the time. She calls it fruit cocktail. Student: I'm not sure. How about if I just count from 1 to 10 twice? Student: As far as I'm concerned, it's still the unknown quantity. Teacher: If you have 5 people and only 4 apples, how would you divide them? Student: I'd ask someone to go get a knife and whoever was stupid enough to go wouldn't get an apple. Student: I generally ask someone who's smarter than I am. Student: That's not fair; you answer the easy ones and leave us with the hard one ! Student: Good ?, that's perfect ! Teacher: If I had seven oranges in one hand and eight oranges in the other, what would I have ? Student: Yes, teacher-one, two, three, four, five, six, seven, eight, nine, ten. Student: I've added these figures ten times. Student: And here are my ten answers ! Teacher: Anna, can you count to 10 without mistakes? Teacher: Now, Bob, can you count from 10 to 20? Bob: That depends, with or without mistakes.. Teacher: If you add 9452 and 1908, then divide the answer by 6 and multiply by 8, what would you get? 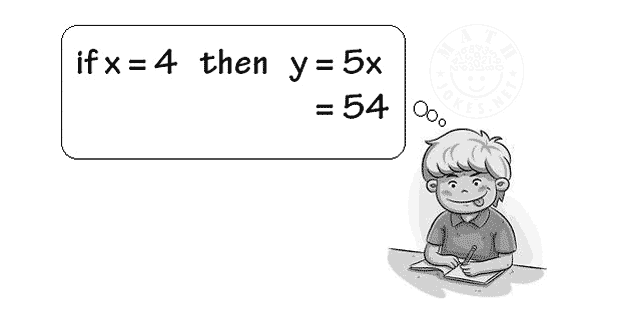 Student: The wrong answer ! Teacher: Now, Bob, you take over, beginning with 11. Teacher: What kind of counting is that? Bob: Who's counting? I'm calling signals. Teacher: If you got $10 from 10 people, what would you have ? Student: A new bike ! A graduate student of mathematics who used to come to the University on foot every day arrives one day on a fancy new bicycle. "Where did you get the bike from?" his friends asked. "It's a `thank you' present", he explains, "from that freshman girl I've been tutoring. Yesterday she called me and told that she had passed her math final and wanted to drop by to thank me in person. She arrived at my place on her bicycle. When I had let her in, she took all her clothes off, smiled at me, and said: `You can get from me whatever you desire!'" One of his friends remarks: "You made a really smart choice when you took the bicycle." "Yeah", another friend adds, "just imagine how silly you would have looked in a girl's clothes - and they wouldn't have fit you anyway!"